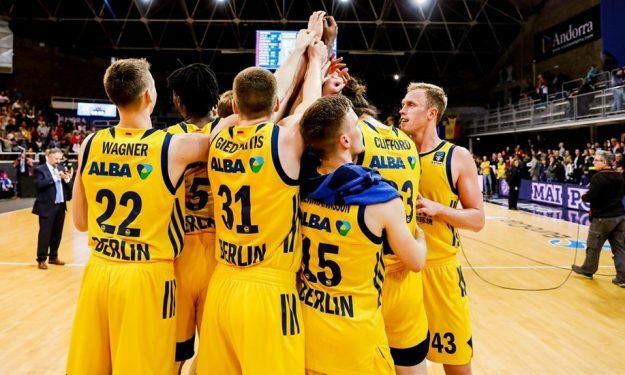 Alba Berlin managed to overcome MoraBanc Andorra winning the semifinals series and reaching the EuroCup Finals where they will clash with Valencia. MoraBanc Andorra managed to get back into the game after trailing at halftime but Alba Berlin took over once again and recorded an 87-81 road win finishing the series 2-0 and advancing to the EuroCup Finals where they will clash with Valencia. Peyton Siva nailed game-high 21 points for the victors while Rokas Giedraitis scored 14 and Joshiko Saibou added 12 points. For Andorra, Andrew Albicy banked 20 points and Jerome Jordan helped him with 17. Siva and Saibou gave Alba the 51-42 halftime lead with ten points each but Andorra recovered after the break led by Jordan who scored seven straight points. The hosts even took the lead (54-53) but only for a moment as Alba made the crucial 10-0 run to regain some distance. Andorra made one final push and cut the distance to just two points (83-81) near the end but couldn’t finish the comeback as Alba held on for the win. Alba will play in the EuroCup Finals for the second time in club history and will face Valencia in their effort to win the first title in a European competition since FIBA Korac Cup back in 1995.